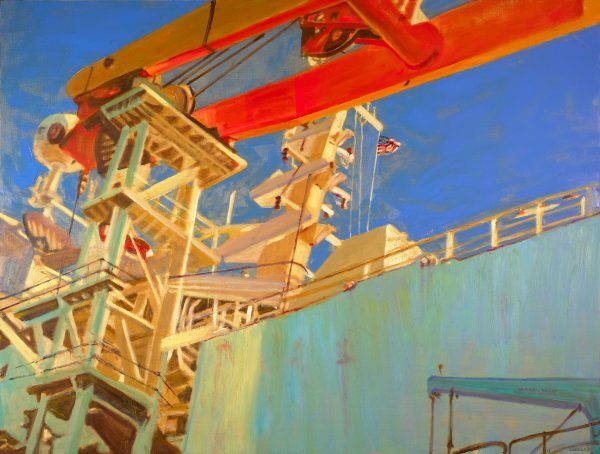 Clayton Galleries, 4105 South MacDill Avenue, will open its 2017 season with a one-person exhibition: “Port Side: Paintings by Laura Waller.” The show opens on January 27, and runs through March 11th, 2017. There will be an opening reception for the artist on Friday, January 27, from 7- 9 p.m. Waller, a Tampa-based artist and Florida resident since childhood, has focused on working waterfronts in Florida and Maine for the past ten years. Port Tampa Bay has been of specific interest to her because of the massive scale of the freighters, cranes, docks and forklifts. Waller works out of her two studios in Maine and Florida. Her paintings can be found in the permanent collections of: American Victory Museum, Tampa, FL; Eli Lily and Company, New York, NY; Raymond James Financial, St. Petersburg, FL; and Mayo Clinic, Rochester, MN. Gallery Hours are: Tuesday though Friday, 10 a.m. to 5 p.m. and Saturday, 11 a.m. to 4 p.m.